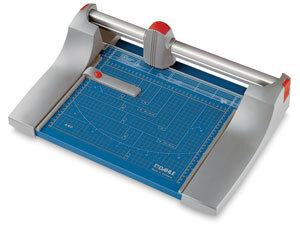 Dahle's Premium Rolling Trimmers are designed for heavy-duty applications. Whether cutting a matboard, a single sheet of paper, or 30 sheets of paper at a time, you can expect a burr-free cut each and every time. Designed for daily commercial use, these trimmers are the preferred choice of professional photographers, picture framers, and print and copy shops. The heavy-duty cutting capacity is made possible by a thick, walled, square aluminum guide rod that provides maximum strength and minimal side movement of the cutting head. The trimmer's ground, self-sharpening, Solingen steel blade cuts with precision in either direction. 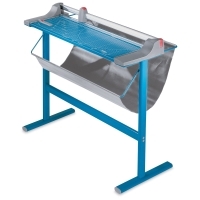 Enclosed in a plastic safety housing for complete protection from injury, the blade is also self-sharpening. The sturdy metal base features both inch and metric scales, an automatic see-through paper clamp, and non-slip rubber feet. The 36-1/4" and 51-1/8" trimmers are available with a floor stand, or they can be placed on a table or mounted on a wall. The smaller units also can be wall-mounted. 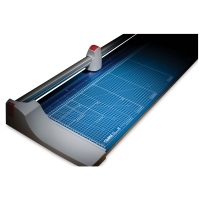 The Dahle Premium Rolling Trimmer includes a limited lifetime manufacturer's warranty.